The training will be held at the National Safe Place Network (NSPN) offices located at 2722 Crittenden Drive, Louisville, KY 40209. The cost of the training is $600.00 per person, which includes 4 meals and all training materials. Click here to register for the training. For more information on the training and lodging, click here. We’re Safe Place and we want to help. Connect with others at Safe Place Connect! 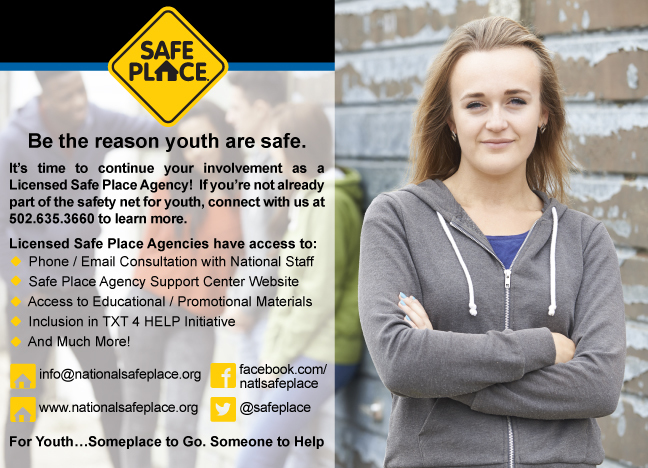 Safe Place Connect is a community forum where licensed Safe Place agencies and sites can discuss topics of interest, share resources, and connect to access a strong network of support. Log in now through the Support Center to join a discussion! We'd love to hear how you learned about Safe Place. Participate in this Safe Place poll and see how the news is spreading to others across the country. Is your community safe for young people? We can't deny our world is growing. With growth comes increased opportunity, such as technology (both platform and skill), larger communities, and creative new ways to make our world easier and more convenient. However, these new opportunities and ways of living also increase the risk of unsafe situations and environments for young people. Technology provides a platform to make bullying and stalking easier. Larger communities and faster paced life-styles can create stress on families – even increasing the potential for drug and alcohol abuse. As we continue to open ourselves up to what the world has to offer, youth continue to be faced with more and increasingly difficult challenges. It's a critical time to ensure every young person has someplace to go and someone to help. Help make sure youth in your community aren’t facing these challenges alone. Make your community a Safe Place community. Learn more today. 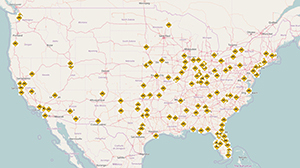 There are more than 20,000 Safe Place sites across the U.S.
Click now to locate the site nearest you. If you’re in trouble or need help, text SAFE and your current location (address, city, state) to 4HELP (44357) for immediate help.